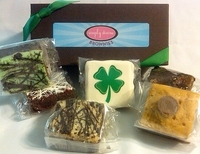 Our collection of 6 scrumptious brownie favorites and the message "Good fortune to you!" A sampler with half a dozen brownies includes our peppermint brownie, our turtle brownie, our peanut butter brownie, our chocolate frosted brownie, our cappuccino brownie, and our Belgian chocolate brownie and a chocolate dipped image brownie. This collection is tied with a green ribbon and St. Patrick's Day flourish.